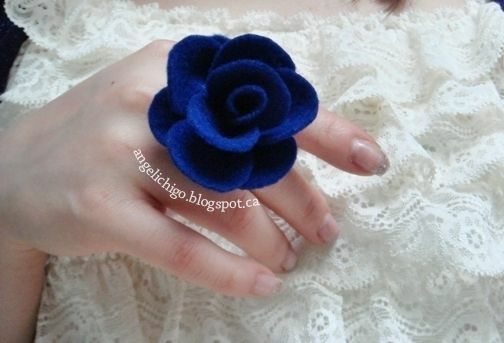 This felt rose ring was a project that I did few years back and was my first time doing a ring using felt. It was originally based on a ring that a friend purchased elsewhere and I thought I could pay for less and make my own. So I experimented it myself at home. I am happy the way it turned out, quite versatile as I can make it as a brooch, earrings or a headpiece. Step 2: Cut Out As Much Petals As You Wish. I used 11 petals. You can cut more to make your rose to have more volume. My petal size is within 1 inch x 1 inch. Step 6: Take Four of Them and Sew Them Together. Step 7: You Should Have Something Like This After Sewing the 4. Step 8: Repeat Another Set of 4 and a Set of 2. Keeping One Petal Remaining. Step 9: Now, Stack the 3 Sets Together and Sew. Step 10: Now Mold the Two Petals in the Center and Squeeze a Bit Inwards and Secure With Thread. Step 11: Use the Remaining Pedal and Roll the Tip to Something Like This and Secure With Thread. This will be used as the center pedal. Step 12: Fit the Petal Into the Center and Sew in Place. Tips: you might need to trim the center petal a bit if it appears to be taller than the rest of the petals. Step 13: Cut Out the Same Size Circle As the Ring Blank From the Felt. 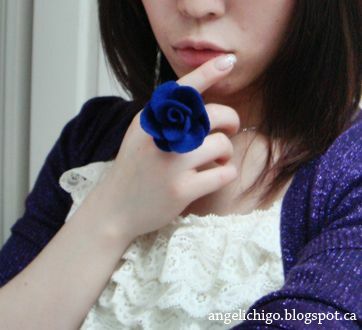 Step 14: Sew the Circle to the Bottom of the Rose. Step 15: You Should Have Something Like This. Now Glue the Circle Onto the Ring Band Circle Area. Step 16: Ta La~ You're Done! It's lovely. In my personal opinion the size is best 4 a broach, headband or barrett. But your workmanship in Fine. ha ha. you know you are the first one to catch that. Thank you! wow! it's so easy to make and looks beautiful!